Siberian secrets revealed - ancient skeletal creatures appeared earlier than previously thought. Remains of ancient skeletal creatures have been found near the Maya and Yudoma rivers in the Ust-Maya district of Yakutia in Siberia, and have been dated to more than 550 million years old. The previously-known most ancient skeletal creatures were animal reef-builders found in Namibia in 2014, and which were dated to 548 million years old. However, the Siberian find, which includes sponges, corals, coral polyps and jellyfish, is even more significant because it marks the first time scientists have real fragments to study, and not merely fossils. "The findings were not accidental," Andrei Ivantsov, the head of the expedition, told RBTH. "These remains were first found and described by scientist Nina Suvorova in 1958, but no one saw any value in them, and the collection was subsequently lost." 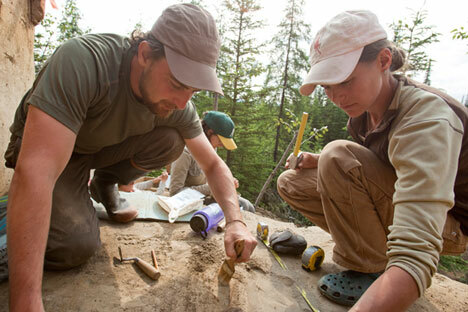 Suvorova's field diaries helped researchers find the unique site, and the first expedition was made in 2014. The results were so interesting that scientists repeated the expedition this year. The findings will be studied in the UK, China, and at the Russian Academy of Sciences' Paleontological Institute and at Moscow State University. Scientists will not be able to study the genome of these creatures, however, since there are no organic pieces. Still, they intend to trace the evolution of these earliest animals, and to establish their habitat by comparing skeletons with imprints found in the White Sea, South Australia, on the Canadian island of Newfoundland, and in Namibia. According to researchers, the phenomenon may be global. The next Siberian expedition is scheduled for 2016.